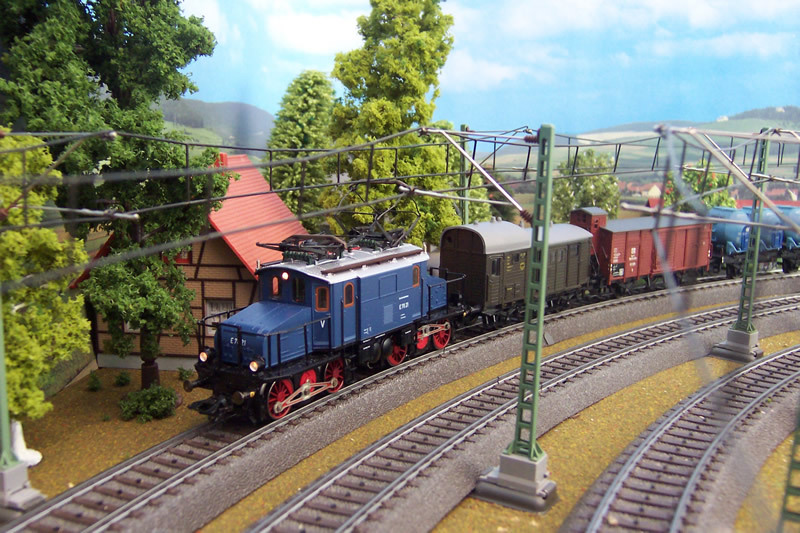 Maerklin model 3748. It is 1950 . I am holidaying from high school, and helping my uncle on a farm close by on the eastern edge of Altkloster. Today, it is sunny, and with a few hours to spare, I took my little 2.1/4 square camera down to the railway lines, where I might preserve some history. I managed to catch 70 21 westbound on the main line west of the station, near a lineside orchard. Today it is far from home, deputising for a steam engine on a small pick up freight. What a classic. The packing wagon still has original DRG markings. Probably against all that my mother warned me, I climbed a signal pole to get this shot. I still get the shudders when I realise how close I was to the overhead electric wires. But I guess it was safe, as signal maintenance men would have used it. Of course, in the 21st century, the publics straying on to railway property is no longer tolerated. This engine is due for scrapping because the DB has plans for building a fleet of modern electric locomotives for both freight and passenger duties. The two members of this class were built in 1920 for use in Bavaria and were used latterly on the Berchtesgaden Freilassing freight line, for push and pull service.70 21 was decommissioned by the DB in December 1951.